at Ringsend and Irishtown Community Centre. There was good news for anyone who would like to learn how to use computers when Minister for Communications, Climate Action and Environment, Denis Naughten, T.D., announced last December that his Department will provide €2.2m to 15 community and not-for-profit organisations to deliver basic digital skills training to people under the Department’s new Digital Skills for Citizens Grant Scheme. The Digital Skills for Citizens Scheme is a key part of the Government’s National Digital Strategy, which recognises the importance of enabling all citizens to realise the full social and economic potential of the digital world. A large portion of the available funds will go to Age Action’s Getting Started Programme, established in April 2007 as a free programme for older people to help them gain confidence and basic skills in computers, internet and mobile phones. Since then, hundreds of people across Ireland have volunteered with the training programme, which has provided training for over 27,000 new users aged 55 and over. The Age Action Programme is designed to be user-friendly, allowing participants to work at their own pace, and is a great way to get started. The training takes place in class groups small enough to provide plenty of relaxed one-to-one tuition and runs in libraries, community centres, family resource centres, corporate offices, and housing complexes for older people. There is no doubt that having access to the online world can make a huge difference to people’s lives and perhaps no more so than for older members of the community, affording them increased opportunities for personal development and self-sufficiency and new opportunities for communication, social connections and networking. Although internet use amongst over-65s both in Ireland and the EU is increasing, nearly trebling over the past ten years, older people can find the very idea of going online daunting and there are still a considerable number of older citizens who do not go online regularly or who have never used a computer. Ringsend Community College and Ringsend and Irishtown Community Centre provide free computer classes for people of every age group. NewsFour spoke to Brendan Wicks, the man to see in the Community Centre about all things computer-related. Under the auspices of DIT, he runs classes for people of any age, catering for complete beginners and for students who want to go a bit further and study for the ECDL (European Computer Driving License). He told NewsFour, “I’ve had people in here from low teens to people in their 90’s who have successfully learned how to use computers.” Classes take place from 10am-12pm and from 2pm-4pm, Monday to Thursday and from 10am-12pm and 1pm-3pm on Friday. 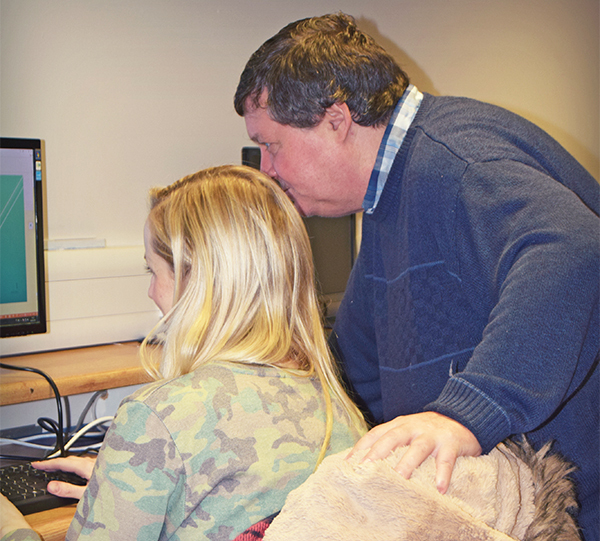 The ECDL classes are structured and the course is accredited, but the centre is happy to see people who want to take their time and learn at their own pace. Between 12-2pm Brendan provides one-to-one tuition for anyone who wants to learn how to perform a specific task, such as create an email or build a CV. In the near future the Community Centre will facilitate learner drivers who need access to computers to study for the theory test online. Free computer literacy classes are also available at Ringsend College on Tuesday evenings from 6.30pm to 9.30pm, catering for new users who just want to acquire enough basic skills to get them started or who want to further their study up to Level 3. Drop into the college to find out more. So if learning to use a computer, or knowing how to make the most of your tablet or smartphone is on your ‘to-do’ list, there’s never been a better time to start.